A range of high quality lifejackets from brand leaders Baltic catering for babies and children. All lifejackets have a 5 year guarantee. European CE standard EN395 - 100N buoyancy. Large collars to protect the head. Easy to reach lifting handle or a lifting becket. A crutch strap (beaver tail on the baby and small child lifejackets) to keep the lifejacket in place. All of Baltic's ifejackets are tested and approved by the accredited test institute Force Technology. Baltic Original Lifejacket for Child 0-15kgs. Large Collar to protect the childs head. Manufactured using high visibility fabric. Lifting Handle behind the Collar. Baltic Original Lifejacket for Child 15 - 30kgs. Baltic Skipper Lifejacket for Child 30 - 40kgs. 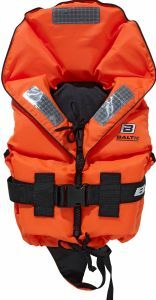 Baltic Skipper Lifejacket for Child 40 - 50kgs.